Cell Again is an exciting franchised business that specializes in buying, selling, and repairing new and used cell phones without the hassle of contracts. 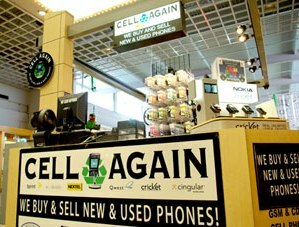 Cell again focuses on low-overhead, mall-based kiosk locations where customers can sell their old cell phones and purchase gently used and refurbished phones and accessories. Top New Franchises got the inside scoop on this innovative, cutting edge concept from Matt Kelly, founder & CEO of Cell Again. Top New Franchises: Matt, what was the inspiration for the Cell Again franchise concept? Matt Kelly: I was involved with the traditional cell phone franchise business, both as a commercial leasing agent helping to secure locations for franchisees, and, later, as a franchise owner myself. The traditional cell phone retailer is really in the business of selling service contracts for 3rd party providers, such as AT&T, Verizon, etc. They primarily see phone and accessory sales simply as a means to the end of selling contracts. They sell new phones at a deep discount in order get the consumer to sign up for a 1- or 2-year contract, but have little interest in selling phones to the vast numbers of consumers who want to upgrade and/or replace their phones. It’s a very tough & competitive business selling contracts. But I recognized that there was virtually no one set up to meet the rising consumer demand for the equipment itself. I developed Cell Again to do just that. Top New Franchises: How do you describe the Cell Again franchise concept? Matt Kelly: The Cell Again concept is a fun and thrilling business. At our specially designed kiosks at mall and other high-traffic locations, Cell Again buys and sells new, refurbished and used phones, discounted new models, performs repairs on cell phones, iPods, and small electronics. A franchisee is an independent operator who sells phones, not contracts. People want to buy new and used phones, they want to have their phones repaired or sell them outright. Cell Again takes a commodity that usually sits in a drawer at home and turns that into a profitable transaction for both sides. The customer is happy to have cash, and we are happy to have a fantastic product to sell to the next customer that wants a different phone. Top New Franchises: I know you can’t disclose numbers, but can buying and selling cell phones really be profitable? Matt Kelly: The key to this business is the customer value perception created by the traditional cell phone companies and carriers. Let’s say Customer A signs up for a 1 year cell phone plan, and as part of the deal gets a new $249 phone but only pays $29.00 for it. He uses the phone for a year or two, but changes carriers and gets a new phone in that deal. If he’s offered $30 for the phone he paid $29 for and used for a year, he’ll be overjoyed. Let’s say Customer B signed up for the same deal, but dropped his discounted phone in the bathtub a week later. He’s now upset to find that his $29 phone will cost him $249 to replace. At Cell Again, he’ll be overjoyed to learn that he can get the same phone, gently used or refurbished, with a warrantee, for half that. It’s a win-win-win for the seller, the buyer and the Cell Again franchisee. Top New Franchises: When did you launch the your franchise program? How many franchises are up and running? Is the chain growing? Matt Kelly: Definitely growing! We launched in January of 2010, already have 7 great franchisees on board. We’re growing at a pace that is right in line with our projections. The affordable concept entry costs and our proprietary systems should continue to drive strong franchise interest. Top New Franchises: Where are you looking to expand? What types of markets and demographics work best? Matt Kelly: We’ll expand in any market that has cellular phones. Cell Again is a concept that could work in any country. Our focus for the moment is the markets in the United States, Canada, and South and Central America. Anyone with a cell phone is our demographic. Any customer that wishes to buy, sell, trade, or repair a cell phone can find a fit with our services. Top New Franchises: How does the Cell Again concept work on the consumer level? Have the recent launch of the iPhone4 and Droid operating systems created more – or less – demand? Matt Kelly: Anytime a new phone or a large launch like the iPhone 4 comes out we see a large influx of phones brought into our stores. Cell Again gives customers a place where they can instantly sell their 3G iPhones to be able to afford the new 4G iPhone. Whenever a new product comes out there are customers who want the latest and greatest phones. We’ll purchase their older phones, giving them the chance to offset the cost of their new phones. Cell Again takes the older phone and sells it at a discounted price compared to the new price of the same phone. This allows customers that may not be able to afford the newest iPhone to purchase a slightly older model at a wallet-friendly price. This is the same concept for all other phones, iPods, and small electronics. Top New Franchises: What is the need in the marketplace that Cell Again franchise owners will meet? How does Cell Again’s solutions differ from competing programs? Matt Kelly: Mobile phones have become our 11th finger–we can’t be without them. Broken or lost phones used to have to mean days out of touch with your entire network. Cell Again offers an instant way to stay in communication. We cut the time you’re out of touch to an hour, instead of a week. Cell Again means you can be instantly back up and running. If you’ve ever broken your phone and are still under contract, your only instant option is to pay full price. But with Cell Again, you have an immediate option to save money by purchasing a fully tested used, new, or refurbished handset. Cell Again franchisees give consumers peace of mind; they’re purchasing phones from a store front location, not an online site where you have to wait 5 days just to take a risk on a used phone, and worry about being cheated. Cell Again offers warranties on all of our handsets and friendly service to make sure the customer is taken care of in the right way. Cell Again takes environmental concerns seriously. We advocate keeping cell phones in circulation, reducing the environmental costs to produce new phones, and prevent phones from going into a landfill. We also function as a recycling place for any headset. 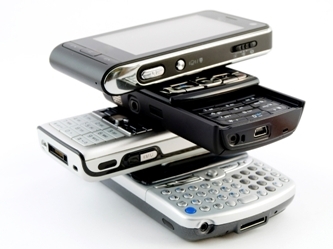 Customers can drop off their used phones, and even if we don’t purchase the handset, we’ll recycle it for them. Cell Again is the first in the marketplace to provide an upscale used, new, refurbished cellular experience that doesn’t sell contracts. Since we’re in their local mall, consumers can instantly replace their handsets. We stand far and above Internet sites like eBay and Craigslist because we allow the customer to shop a physical selection and with a guarantee. When you compare the headache of waiting for a phone to arrive, receiving a phone that is in terrible shape, or even broken, the instant service of a trusted Cell Again franchisee is an easy choice. Top New Franchises: Tell us a little bit about the kind of person who would make a good Cell Again franchise owner? What are the backgrounds of some of your franchise owners? Matt Kelly: Cell Again franchisees have diverse backgrounds: a traditional cell phone dealer, a stockbroker, a former mortgage broker. Sales & marketing experience is definitely a plus. Someone already operating a business or businesses in the mall might be ideal. Top New Franchises: How do Cell Again franchise owners attract new customers? How do they create repeat business? Matt Kelly: New customers come from within the existing cell phone store structure. We get referrals constantly. Cell phone stores are in the business of contracts; they do not want to sell phones outright, even at a higher price. That’s why prices are low; they want the customer to renew or sign-up for a new plan. However, since most customers are under contract, we get instant referrals from stores within the malls and surrounding retail pads. We attract customers with ads placed around the malls, or if the Cell Again store is in an shopping center we do traditional advertising, like radio, TV, and billboards. Repeat business happens naturally. Customers tell their friends and family about Cell Again: when you break your phone you usually tell your friends and family that you don’t have your phone. As soon as Cell Again solves their issue, word of mouth starts to spread. Top New Franchises: Of the training and support services you provide franchisees, which do you think are most valuable to their long-term success? Matt Kelly: We are constantly refreshing our training videos and courses. Cell Again offers training on how to repair phones, purchasing phones, and selling phones. Our proprietary software is built to help franchisees know the true market value of a given cell phone. That allows them to determine the right price to pay for a used phone, which is a crucial step in building long-term success. We also ensure our franchisees purchase inventory from a reputable Cell Again authorized wholesaler to supplement stock. Corporate does not make profits off of wholesale phones our franchisees purchase. We simply negotiate the best pricing for the franchises. Matt Kelly: We are in the technology business, so we take it as our responsibility to do what’s necessary to be a subject matter expert. We have the most up-to-date knowledge and database of cell phone information of any retailer we know of. If a franchisee does have a question, they can call or email our help desk to get any question answered. Cell Again maintains an internal intranet site called Franhive; it’s key to communicating changes and new ideas that Cell Again is implementing. The site also gives franchisees access to forums, ads, and success stories with best practices to address issue-solving. Top New Franchises: What makes Cell Again different from other franchise opportunities? How is it a unique opportunity? Matt Kelly: We are a totally new concept, and you can be first in. You could be the way that malls offer cellular phone services to consumers in the future. Cell Again has extremely competitive start-up costs when compared to traditional cellular franchises, or even other franchises in general. Cell Again franchise fees are affordable because we’ve refined the process. Most franchisees were shocked at how quickly they could become profitable. Top New Franchises: What do you see as being the greatest non-financial rewards of being part of the Cell Again franchise family? Matt Kelly: The excitement of being part of a new spin-off to an existing industry. Cell Again is part of a new way of thinking about cellular phones. As long as we have mobile phones, Cell Again will have a place in the business world. The Cell Again concept is just downright fun and exciting. Your customer is happy because you saved them money. You’re happy because you know the profits you just made off that phone. You’re offering people the chance to keep cellular phones affordable, keep them out of landfills, and giving them a place where they know they can get great services for all their small electronic needs. Top New Franchises: Thanks for sharing the details of the Cell Again franchise opportunity, Matt. Matt Kelly: Thanks for the opportunity. I would like to learn more about cell again franchise, how many francxhises do you currently have as of 1/14/13? How much is the franchise fee? How do we build stock starting out?